Calcium Tschermak’s pyroxene (CaTs), CaAlAlSiO6, is well known as an important component in pyroxene. It is a member of the Ca clinopyroxene group in which Al dominates in the M1 site. Pyroxenes with more than 80 mol% CaTs were observed previously in Ca-, Al-rich refractory inclusions (CAI) from five carbonaceous chondrites. This study re-investigated the near end-member CaTs in the Allende and Murray chondrites. 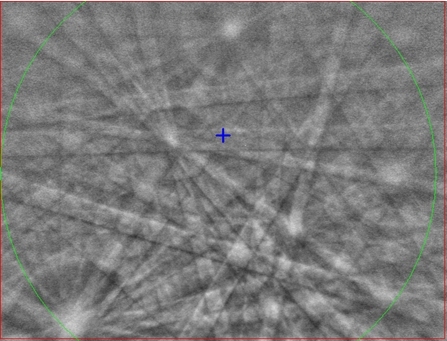 Electron backscatter diffraction (EBSD) is used to establish that its crystal structure is monoclinic, C2/c; a = 9.609 Å, b = 8.652 Å, c = 5.274 Å, ß =106.06º, V = 421.35 Å3 and Z = 4. Its EBSD pattern is an excellent match to that of synthetic CaAlAlSiO6 with the C2/c structure. MicroRaman is also carried out to confirm the crystal structure. The Allende CaTs, with 46.00 wt% Al2O3 and 97 mol% Al in the M1 site, has the formula Ca1.02(Al0.97Fe0.01Mg0.01)∑0.99(Si1.00Al1.00)∑2.00O6. It occurs as micro-sized crystals along with melilite, hibonite, perovskite, spinel, corundum, Ti3+-rich pyroxene, and grossular in a fluffy Type A CAI. It is probably a secondary phase resulting from the alteration of gehlenitic melilite. The CaTs in Murray, with a formula Ca0.98(Al0.81Mg0.16Ti4+0.04)∑1.01(Si1.11Al0.89)∑2.00O6, occurs with hibonite and Al-rich diopside in a glass-free refractory spherule. This sample formed by solidification of a once-molten droplet early in the history of the solar system. 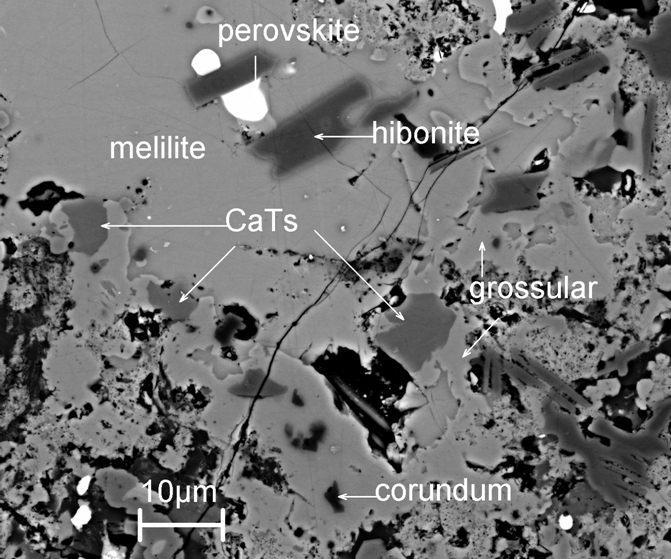 The CaTs pyroxene, now named kushiroite, is difficult to identify visually in the meteorite matrix, as illustrated in the comparison of a visible and an SEM image.